High performance motorcycle parts well suited to your motorcycle and to your riding style will keep you on the road and give you peace of mind. Motorcycle parts are all the pieces of equipment and equipment systems your bike's manufacturer used to create your machine. 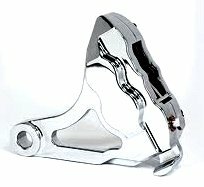 I'll be adding information about lots more high performance motorcycle parts in the future. Now, I don't mean "most expensive" when I say "high performance." Carefully chosen motorcycle parts enable you to deal with routine riding situations and manage surprises encountered when traveling on your motorcycle. The right motorcycle parts can make the difference between having a great ride and getting stuck along side the road. They can make the difference between a motorcycle that gives you enjoyment and a motorcycle that gives you headaches. Motorcycle parts manufacturers are always improving their products with new features, design changes and better materials. In many instances -- for a single replacement motorcycle part -- you have a variety of designs and manufacturers to choose from. New designs that solve unique problems and accomplish very specific tasks crop up all the time. Small differences in products or unique features can make one product more suitable than another. When it's time to replace any motorcycle part and you're satisfied with the current part's overall performance, then go with something close to the manufacturer's original equipment. For example, motorcycle tire manufacturers are always looking to improve their products and so they do a better job of meeting riders' specific needs. So it would be logical for you to base any new tire selection on the performance capabilities of the bike's original tires, but with slight differences based on your own riding preferences. What product features are most desirable to you? What product best suits your motorcycle? It stands to reason that certain replacement parts look and function best on your motorcycle. For example, brake rotors made to complement a racing motorcycle might look way out of place on a basic road bike. When you're dealing with motorcycle parts, "value" is determined by the quality of the product in relation to the price you pay. Some products are high value -- they offer numerous desirable features at a competitive price. Some offer less value. An item may have similar features as other products but it costs more. By researching the brands, you can find high performance motorcycle parts that give you the features you want at the most competitive price. …And any other detail important to you. Gathering motorcycle parts information, determining your options and focusing on a new cycle part that will improve your bike and make riding more enjoyable may take a while. Then attach your new high performance motorcycle part and go for a long ride.